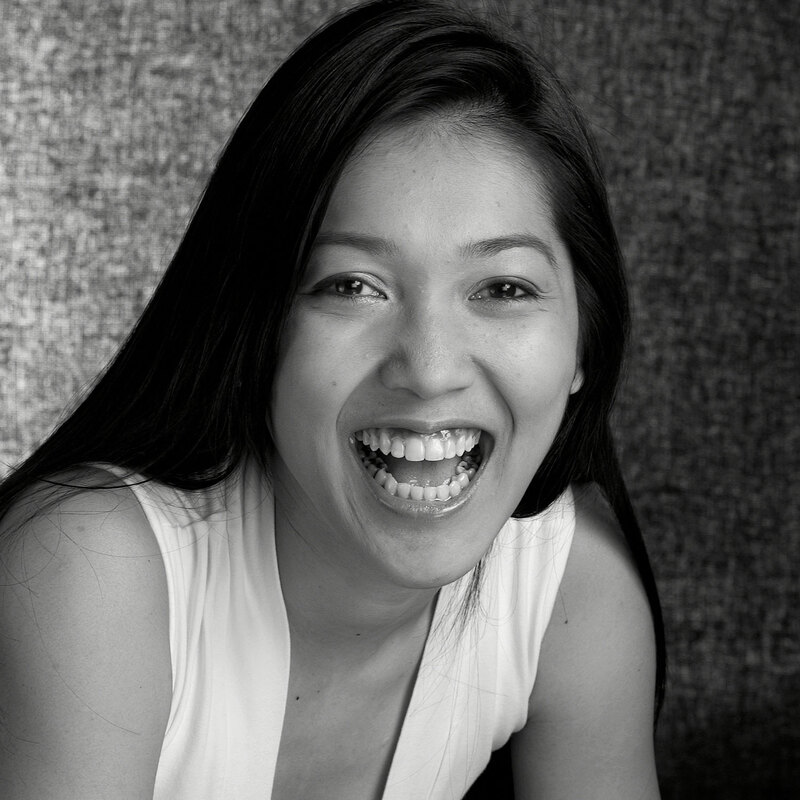 At a point when too many beauty products are using toxic chemicals, it’s a great opportunity to know the insights of Supadra Geronimo, the woman behind a brand that reintroduces natural and time-honoured ingredients to the new generation. Supadra Geronimo is a native of Thailand, one of the countries in the world that boast of enchanting beauty and rich culture. Having access to a range of precious botanicals, plus the innate expertise that she acquired from her ancestors, Supadra has decided to come up with her own skincare formulas that make use of potent ingredients from Thailand. Siam Seas was born out of the desire to foster awareness on Southeast Asian ingredients and philosophies that can reintroduce a safe and effective way to deal with skincare. 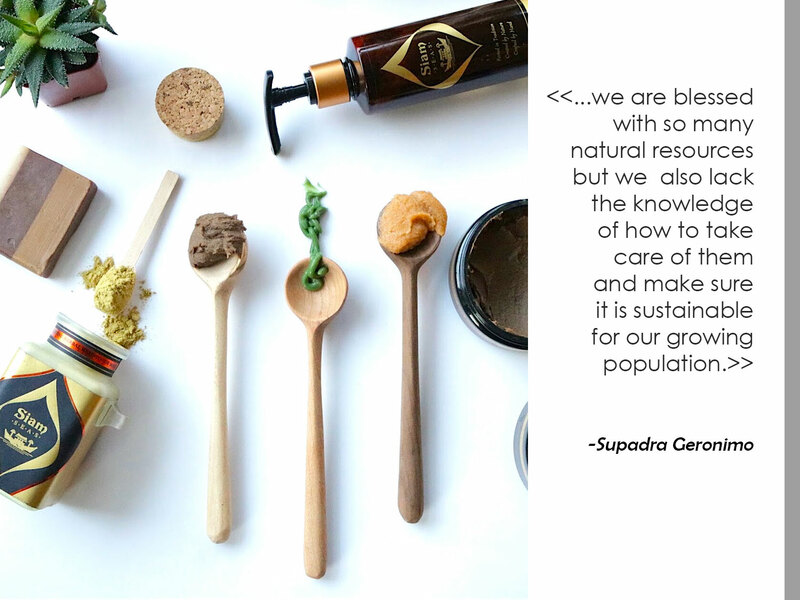 Using specialised knowledge, Supadra has been instrumental in making handmade beauty products in their purest state, available in small batches for a worldwide audience to experience spa-like luxury. 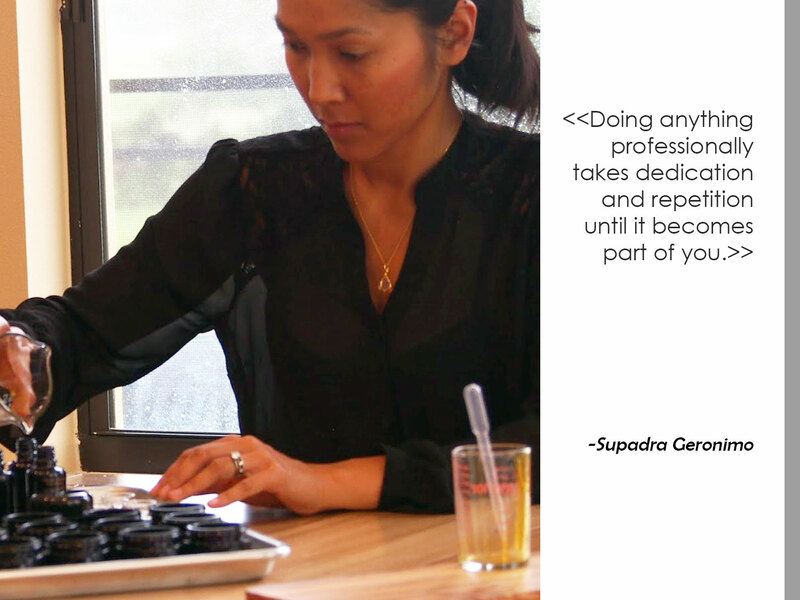 In this interview with Supadra, you will learn more about the skincare expert and the brand that she introduced. Your shift from being a professional pool player to a beauty expert is interesting. Can you share us some interesting information about your previous career? Doing anything professionally takes dedication and repetition until it becomes part of you. Pool taught me so many things but one of the most important things it taught me was to trust my instinct. I played my best pool when I didn’t think at all. It just came to me. It felt like dancing – smooth flowing. We called it “being in the zone”. You don’t analyze, you don’t expect, you just let instinct take over. The dilemma is that human beings like to be in control, it is hard for us to just be and let things happen. You want to make sure you do better so you “try” to make your body do it. I learned that is a wall that blocks your brain’s ability to access your body’s muscle memory. When put under pressure, our brains kick into this instinctive mode and use the muscle memory developed from repetition to guide your body through the task. The instinct comes from the time and dedication spent training when you are not under pressure until it becomes your second nature. If you allow your instincts to take over they will guide your body through the task at hand under pressure. That is what pool taught me. This lesson can be applied to anything and life. In fact, most of Siam SEAS formulas and scent profiles always initially come from my instinct before it gets analyzed and refined. I quiet my mind and let my instincts guide me using what I have learned to create and deliver what my heart desires. You will be amazed what your instinct can do when you let it take over. What is the turning point in your life that made you decide to join the natural beauty industry? Growing up in Thailand we were always so connected with nature. It was in everything we did – food, healing, living. I have always believed in the power of nature. When I came here it was almost like I left that part of me behind, being wooed by a more advanced way of life. It was when I was on my honeymoon in Hawaii with my husband, John. We walked into this beautiful natural handmade soap store. It reminded me of Thailand. It brought me back home, to my childhood when I used to have fun and be silly with facemasks. Though I couldn’t find Thai herbs in the soap store, I was reminded of my roots, my belief in the power of nature. It was such a beautiful time; I was so fulfilled and happy emotionally. It hit me then that this feeling is something I wanted to feel every day regardless of my problematic skin. It’s when I realised I needed healing. No more hiding. No more wishing for perfect skin but instead, start a journey to heal my mind and skin together using what I believe in – mindfulness and nature. And the natural beauty industry represents all that and more. I started formulating for myself, then my inner circle of friends and family and more broadly. I started to be involved in the natural beauty community. The people I have met throughout this journey are so very incredibly thoughtful and kind. The knowledge I have learned from brand owners in the natural beauty industry, the integrity they display in everything they do both for Mother Nature and for the people. While we promote the health of our skin, we also promote the health of our mind and in all aspects of our living. I was drawn to that. It keeps inspiring me to do what I do and help spread awareness of better living. That’s when I decided to share my own personal journey with the natural beauty industry. As someone who grew up in Thailand, what do you think are the influences that shaped your future? Thai culture believes in ancestry, grounded living, connection with nature, these values will never leave me. I think it plays a big role in shaping both my life and the future of Siam SEAS. I am fortunate to be able to live in both countries; it allows me to see best of both worlds and appreciate both values. While being in a third world country taught the essentials of life and grounded living, America is forward thinking and innovative. I think incorporating the science and technology of America with the heritage and knowledge of ancestry can provide for a balanced happy way of living. I have read that as a child, you’ve tried using raw and natural beauty ingredients and have been exposed to botanicals. Is there a particular beauty routine that has contributed to your nice complexion? My staples were definitely a radiance inducer consisting of Thanaka, turmeric, tamarind paste and calcium carbonate and my hair was always marinated in coconut oil sometimes for hours. My grandma or my mom would sometimes mix in some special herbs like Rice powder, Ya Nang, Rang Jued, Som Poy in my mask when we wanted to do something different. These botanicals are so potent. I didn’t know this at the time but Grandma knew to always balance the PH in all my masks. Tamarind paste is very acidic, it contains natural AHA’s to exfoliate the dull skin cells but it is not healthy to be used alone on skin. Thanaka and calcium carbonate absorb impurities from your pores to help keep them unclogged while balancing the PH of tamarind paste making it suitable for the skin while allowing the tamarind to do its job on skin at maximum efficacy without skin irritation. And turmeric is to heal skin through inflammation. I definitely learned the simplicity and safety of the art of mixing from them in my childhood years. My wonderful beauty routine though is just laying outdoor on our rooftop and looking at the sky at night with masked skin and hair. I was in love with pampering and romantic experiences. I could spend hours creating an in-home spa like treatment, showering outdoors, jumping in the river. My beauty routine always somehow connects with nature. Your beautiful skin is a reflection of your beauty brand. In your past interviews, I’ve read that you’ve suffered from acne at one point. What were the factors that triggered it? How did you overcome it? Aw, thank you though I have to thank digital technology for that perfect complexion image. My skin is far from perfect but I am ok with that. I no longer hide my imperfections. On my skin-healing journey, I soon came to the realisation that the healing needed to begin from within, otherwise I would never be happy even if my skin was perfect. So I stopped letting imperfection define who I am. I do suffer from acne when I fail to take care of myself. I have always said that your skin is a reflection of your well-being on the inside. For me, when I started my healing journey, I started to pay more attention to my body. See how it reacts to certain things. Things that you are sensitive to might not be the things another is sensitive to. Your body is unique. You have got to pay close attention to it. My body is so very sensitive to unbalanced fatty acid, sugar and stimulants. My body doesn’t process well with excess hormones and because I constantly beating up on my liver with food I’m sensitive to, it isn’t effectively getting rid of pollutants in my body and those toxins show up on my skin. So knowing that I started making mental notes of what I have to do. Emotionally, I started meditating; I started to let go more of things that do not serve me any purpose. Meditation helps ease my tangled mind and allow me to let go. It is such an important element of happy living to just be and let go of what you cannot control. Teaching your heart to stay in the moment here and now is teaching yourself to live in the present and not in the past or the future, to let go of the stress in the past. Physically, I am now religiously watching out for what I put in my body, drink more water and take supplements that help detox my liver and balance my daily intake of omega 3 fatty acids. I sleep more. I make time to exercise. 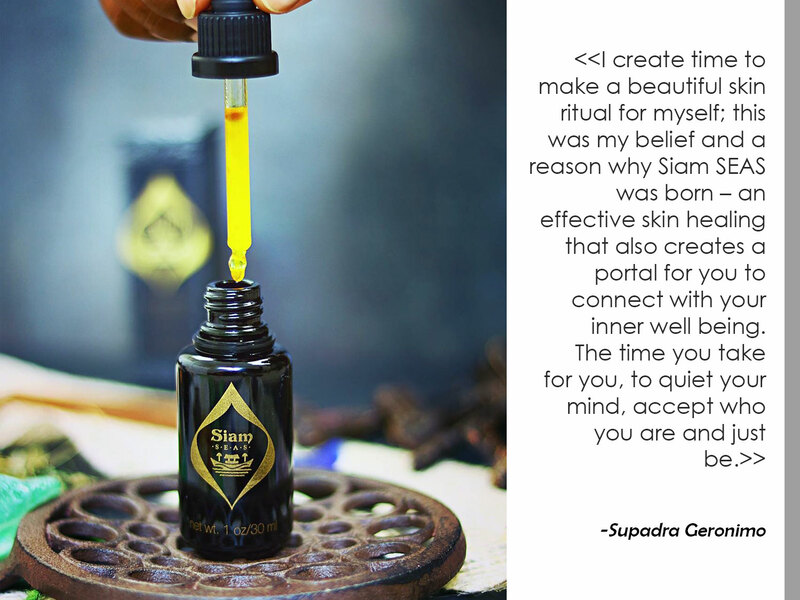 And definitely, I create time to make a beautiful skin ritual for myself; this was my belief and a reason why Siam SEAS was born – an effective skin healing that also creates a portal for you to connect with your inner well-being. The time you take for you, to quiet your mind, accept who you are and just be. Having a relatively new ‘green’ beauty brand, what were the struggles that you experienced while you were in the initial phase of setting up your brand? Time. There was so much that goes behind the scenes when setting up a brand such as ingredient sourcing, formulating, testing, packaging, branding, connecting and more. I am constantly short on time. There is not enough time in the day. Yet, I still want it all. I want time with my family, cuddling with my two children and husband, making a homemade meal, hanging out in a spa with my girlfriends, and creating the time for myself. For a while though, to get Siam SEAS started I had to put everything in the backseat and focus on one thing – Siam SEAS. I couldn’t have done it without my mother, and my family, especially my husband who has been my supportive partner from the second I told him that this is what I wanted to do. He willingly picks up slack on the home front and takes care of me while I focus on my work and my kids who constantly refuel my heart. One day, I asked my daughter what she wanted to do when she grew up and she said “I wanted to do your work mommy, and I’d like to make things for people” 🙂 All stress…gone. You carefully select natural and organic ingredients for your products and have special fondness over Southeast Asian herbs. How are these herbs different? These herbs and plants require a very specific climate to thrive. Southeast Asia has just the right climate, therefore, we are blessed with these wonderful healing plants. That and the rich soil of the undeveloped land, the untouched wildly grown forest. These conditions help create very powerful medicinal properties in plants. For centuries through years of trial and error, our ancestors have learned the properties of these plants; they figured out how to harness the medicinal power and incorporate them into people’s daily lives. That valuable knowledge has been taught and passed down and now with technology we can analyse these properties even further to better utilise the plants. That is what you will start seeing in Siam SEAS formulas, a mixture of ancient knowledge improved through modern analysis. You asked me earlier of how growing up in Thailand shaped my future. I would like to also say that living in such a progressive country like the USA also helped my way of thinking toward Thailand. It’s true we are blessed with so many natural resources but we also lack the knowledge of how to take care of them and make sure it is sustainable for our growing population. Being in the States and learning the sustainability process, the importance of supporting local farms and reusable material is essential to carry on our blessings and make sure our great grandchildren will have the wonderful way of living like we do. It is my mission to bring the sustainability system back to Thailand and working with organisations to teach sustainability to our beautiful people. In connection with the previous question, what are the most outstanding effects of the ingredients that you are using for Siam Seas? Ability to calm inflamed skin and promote expedited healing of cells. I believe inflammation is the most damaging thing to skin. So to prevent that, a healthy diet, an effective inflammation soothing skincare ritual and daytime protection are, in my opinion, the best thing you can do for your skin. Apart from using Siam Seas. Are there other personal beauty care tips that you’d recommend? Touch your skin. Work the tiny muscles on your face. Massage your face with clean hands during the day, morning and night or whenever you feel tightening of the muscles. You can learn effective facial massage from the estheticians. They are many great techniques shared by experts online. It is so essential to drain the lymph system to remove toxins from your body and release the stress from your tiny facial muscles. Lastly, what are the things that consumers can expect in the near future? Are there new formulations that you are currently working on? So many exciting things are happening behind the scenes. We are releasing Yen heal and Hydrate toner. It is quite special. It is not just a hydrating mist but is a hybrid between serum and toner. It has impeccable healing ability while deeply hydrating the skin and protecting the skin from moisture loss. And with this release, I will have a surprise gift, an incredible product that will sweep you away to a floral garden after a torrential rain. I will talk about it in the coming newsletter and social network of Siam SEAS. Be sure to get connected with me! Also, our entire bath and body collection will be transformed into a smaller collection but be more potent and exotic. Did you find this interview with the influencer interesting? Let us know your thoughts by sharing your comments below. Never miss a post. For more useful beauty tips and information, regularly visit Alyaka’s lifestyle magazine.